Sony today introduced a 10-inch version of its Digital Paper device. The DPT-CP1 is "notebook-sized," compared to the original 13-inch "letter-sized" DPT-RP1. 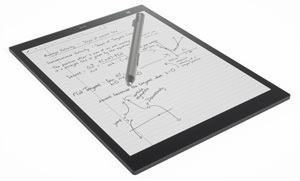 Like the 13-inch model, the notebook-sized device is about a quarter-inch thick, offers a glare-free paper-like display and comes with two different stylus tips (for a pen-like or pencil-like writing experience). It has 16 GB of internal memory and can last up to three weeks on a single charge (with WiFi/Bluetooth turned off), according to the company. Page thumbnails mode, for viewing up to 16 pages at once. For more information, visit the Sony site.